Welcome to the Old Dominion Draft Horse and Mule Association website! All of us at the ODDHMA hope that 2019 brings you health, happiness, and good fortune. 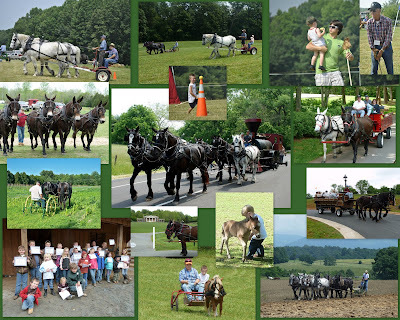 In the Old Dominion Draft Horse and Mule Association, we are dedicated to bringing draft horses and mules to the public at such events as Plow Days, Farm Fun Days, Trail Rides and Drives, Parades and Fairs. The members gather together with their various draft breeds to work and play together, to share tips and experiences and to enjoy each other's company. It is our intention to offer many different ways to enjoy draft equine and we encourage all draft owners and non-draft owners to attend and participate in club sponsored events. If you are ready to embark on a new adventure ~ there is information in these pages for you! Membership in the ODDHMA can provide many benefits. Our newsletter keeps you posted about club events in our area, as well as regional and national events, a members page, classified ads, photo albums from club events, and interesting articles; automatically qualifies you for Year End Point Awards; and provides a solid base of knowledge and contact. We continue to find avenues within the local community to promote and educate others about the draft equine, by sponsoring clinics and assisting in 4-H events. We also offer many volunteer opportunities should you be moved to help at one of our events. Please take a look at our website and you will see why the Old Dominion Draft Horse and Mule Association is a dynamic group of people with the ambition and know-how to make this a successful and active club. The ODDHMA has made every effort to schedule our events so that they are not in conflict with other local horse clubs. We have extended an open invitation to the President of each local draft horse club, inviting their members to participate in our events. Due to the limited number of events available for the draft enthusiast, we encourage our members to participate in as many events as possible throughout the year, regardless of sponsor. We have enjoyed several exciting events this year! As you browse around the site, please check out our club events pages from 2011 - 2015. Our events offer something for everyone! All members are encouraged to attend our activities! This is your club. We look forward to seeing soon. All are welcome to attend!